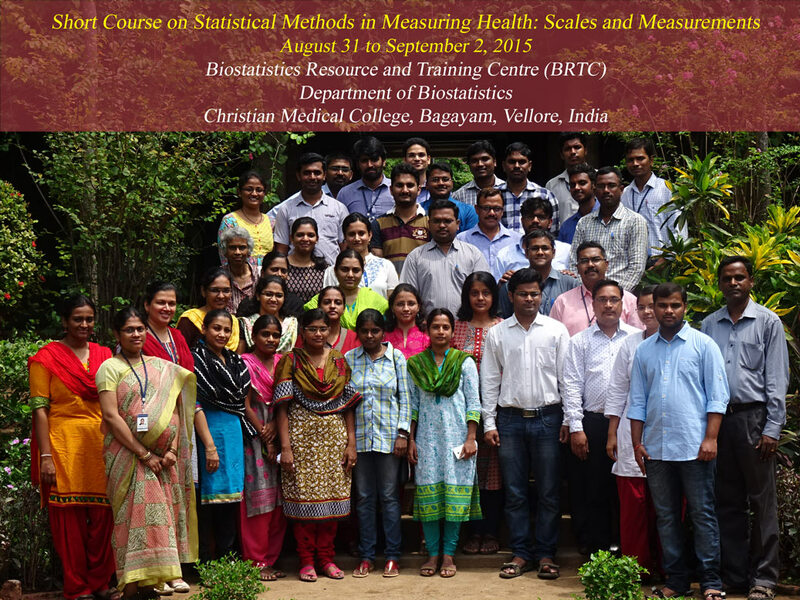 The objective of the workshop is to highlight the importance of scales and measurements in the field of health sciences, and to enlighten the statistical techniques in understanding the concept of measuring health. The course is intended to explain the concepts of validity and reliability, along with the basic computational techniques using SPSS and interpretation of statistical tools related to it. In addition, the group discussions based on the published papers will be made for the clear understanding of the concept to the participants. The course will be more suitable for the Psychiatrists, Dentists, Doctors, Nursing researchers, Social Scientists, Psychologists, physiotherapists, statisticians, PG students in medicine and public health, PhD students, and public health researchers, as the workshop will be more focused on the importance of scales and measurements in health sciences. Course fee Rs. 4,000/- (Four Thousand) should be paid in full by 24th August 2015. Payments can be made by Demand Draft in favor of “Christian Medical College Vellore Association Account”, Payable at Vellore. Course fee includes Course Material, Lunch and Refreshments. Participants will have to bear their own expenses for travel, boarding and lodging. Organizers may arrange basic accommodation with A/C facility in the college campus on request. Only limited accommodation is available and hence the preference will be given to the female participants. Also, list of hotels in Vellore has been provided below. Those who would like to stay outside, please contact them directly to book your accommodation. Sample size calculations for reliability and diagnostic accuracy studies.